If Hersh wanted more beautifully crafted, socially significant, globally oriented, investigative journalism—that captures insightfully the complex nexus of human drama, public policy, and social justice–The Snakehead is it. It continues to garner great reviews. Patrick was reviewed nicely in the book section of today’s Washington Post and his time here in York was stellar. We had some great speakers respond to his reading, and a good group of the Golden Venture passengers came in for the event. That workers in church-based and other nonprofit refugee groups, legal humans rights advocates and immigration reform leaders showed up for our gig in York was thrilling. That so many local friends came, to hear again of our advocacy, as told through the voice of Mr. Keefe’s fine writing, was even more thrilling. Thanks for those who bought the book, for the supportive emails, for your interest in this book which offers the largest backstory ever, for a project that consumed years of our lives here in York. It really means a lot, and we are blessed to have a writer like Patrick telling our story. Did you know I was cited talking about this Golden Venture detention in Their Blood Cries Out, Paul Marshall’s watershed book on religious freedom issues in the early 90s? (We don’t stock used books, but this work is so seminal and urgent, it is one of the very few titles we keep a stock of used ones here,since it is now out of print and hard to find.) We talked with Gary Haugen of world-famous International Justice Mission (IJM) about this in the early 90s as he was starting his extraordinary work against trafficking. Further, I’m interviewed in Steve Garber’s well-received book, The Fabric of Faithfulness: Weaving Together Belief and Behavior (yep) speaking about our work with these Chinese detainees seeking political asylum. It has been on our hearts and minds for years, now, so thought our BookNotes friends should know. You can browse back and read what I wrote yesterday about The Snakehead and why it is important to us, and for anyone interested in the deepest questions the American experience (and a special thanks to those FaceBook friends who prayed that it get in our local paper. It did.) Do check that out if you haven’t. If you want a short visual version, though, this movie clip is Patrick speaking about the book, the drama of the underworld of organized Chinese crime, the wreck of the Golden Venture, and the twists and plots that lead him from Chinatown to China, Burma, Thailand, Kenya, South America, to York, PA. It is a great little video. I can happily call Patrick and his wife our friends, and hope you take a few moments to watch the video. If you want to order the book, please see the special price from last week’s blog special. By the way, since many of our readers have an intentional theological bent, and may want a more integrated Christian perspective, may I recommend the two best books on gracious and faithful immigration views we’ve seen in recent years. The first is written by another friend, M. Daniel Carroll, R., and is called Christians at the Border: Immigration, the Church and the Bible (Baker; $16.99). It came just last year, as immigration issues were growing more contentious, the first book on the subject by an evangelically-oriented publisher. Danny spoke at the Pittsburgh Jubilee conference in February where he spent considerable time with us at the book table. A dear, dear man, a solid Biblical scholar (he teaches Old Testament at Denver Seminary) and a passionate writer, I trust his heart, and his knowledge. This is the book to start with if one wants a compelling, informative, faith-based introduction to this complex issue. I think it is very fair treatment; it admits to complexity, yet moves towards generosity, rich with theological integrity. Even if you don’t agree, it is important. Kudos to Baker for doing it! 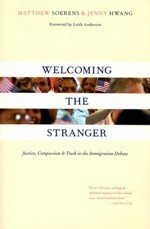 Welcoming the Stranger: Justice, Compassion & Truth in the Immigration Debate by Matthew Soerens & Jenny Hwang (IVP; $15.00) is the best work yet done from an evangelical perspective. Matthew Soerens is an immigration and citizenship counselor at World Relief Dupage in Wheaton, IL and Jenny Hwang is director of advocacy and policy in the Refugee and Immigration Program of World Relief in Baltimore, MD. Endorsements on the back include those from Amy Black (an impeccably thoughtful and balanced political science prof at Wheaton College), Reverend Luis Cortes, Joel Hunter, and Ronald Sider, who says it is “Biblical, urgent, readable. An excellent introduction to this complex moral issue. All thinking evangelicals should read it.” There is a good discussion guide, too. Excellent. Thanks again for reading last week’s post on The Snakehead—it means a lot to us. After today’s fabulous book signing, hosting Patrick, and seeing so many folks who care about our Chinese asylum-seekers, we are energized anew to continue to try to sell books that can help us understand our world, piecing together the good and the bad, helping us be discerning and compassionate, and, having read well, been changed for the better. Good books can do that.